And a lot of other potential players involved in this devastating disease like salt, stress, alcohol, high blood pressure, diabetes, a family history of heart disease, smoking, and triglycerides. But are any of them the real cause of heart disease? Take dietary saturated fats. This lead to a revamping of the American diet to consume less fat and more carbohydrates. With this change in diet there has been an epidemic increase in type 2 diabetes and an explosion in people being overweight and obese. And heart disease is still the number one cause of death for both men and women worldwide. Cholesterol also became the target. Statin drugs were introduced to address this cause of heart disease. Yet statistically 70 to 75% of Americans who have a heart attack have normal cholesterol levels. Which bring us to the main question of this blog post. I highly encourage you to watch this video. But if you can’t, or choose not to, then I’ve done two things for you. First, I’ll share what Dr. Lundell believes to be the real cause of heart disease. Second, after the below video I’ll give you a list of time markers to help you focus on key elements of his video. Let’s start with what Dr. Lundell identifies as the cause of heart disease. It ‘s inflammation triggered by sugar. 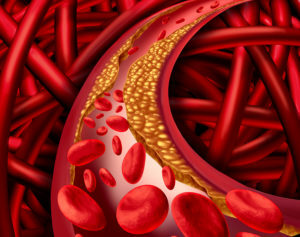 Most cardiovascular health issues center on atherosclerosis, which is the buildup of fatty plaque in your arteries. This buildup has been attributed to LDL cholesterol but as Dr. Lundell clearly presents (in the last 6 minutes of his video) the real cause is sugar. And how it effects your endothelial cell, which line all of your vascular system. Most cells have glucose receptors that help the cell turn off the intake of sugar or glucose into the cell. Endothelial cells to not have glucose receptors. This means they have no mechanism for turning off or stopping the intake of sugar into their cells. When your blood sugar levels are high, then this sugar or glucose overloads the mitochondria of the endothelial cells. This produces extra free radicals, which then cause cellular damage. This triggers an inflammatory response. Which then triggers macrophages of your immune system to consume the oxidized and glycated LDL to form plaque. This is the real cause of heart disease. And as people continue to consume large amounts of sugar, through their food choices, they continue this process of vascular inflammation leading to more plaque formation over time. Which then increases their risk for heart disease. More and more of the medical community is coming to understand that inflammation is the real cause of most diseases. And as Dr. Lundell clearly articulates, inflammation to the endothelial cells caused by sugar overload.